Genesis chapter 22 is one of the greatest chapters in the entire Bible. It records the supreme test of Abraham's faith. God called upon his servant to sacrifice what was dearest to his heart – his own beloved son Isaac. The circumstances seemed to shatter all of Abraham's hopes for the future. Atheists and skeptics have commonly referred to this biblical account as proof that the God of Scripture is monstrous, cruel, and immoral. "What kind of God would require a father to slaughter his own son?" they accusingly ask. It must be remembered that Abraham would have been familiar with human sacrifice. In his day, it was practiced by the godless people that lived around him, and so the command in itself wouldn't have been a real shock to him. With respect to the Divine aspect of the command, God may choose to accommodate the moral and spiritual standards of a certain dispensation without endorsing them, but instead, use it to demonstrate his own will. God knew the end from the very start, and it was never his intention that Isaac should actually be sacrificed. What God really desired from Abraham was his implicit trust. Moreover, God used Abraham's test as a means of differentiating himself from the other gods of the world in relation to human sacrifice. W.H. 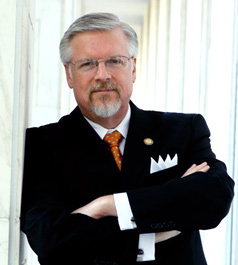 Griffith Thomas in his commentary on Genesis 22 rightly contends, "By this action God bore unmistakable testimony to the error of the heathen as to human sacrifices, and it is a striking fact that from this time forward the Jews never adopted the practice of human sacrifices until they had sunk to the level of the heathen around them." 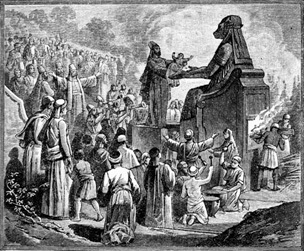 The Bible records Israel's sad descent into the practice of child-sacrifice. In the name of Molech, the god of the Ammonites, an idol made of bronze that outstretched his heated red-hot arms, the Israelites placed their children to die an unspeakable death. The book of I Kings says even King Solomon was drawn away from God and into the idol worship of other nations, which included child-sacrifice. According to 2 Kings, Israel's wicked King Manasseh offered his son as a sacrifice. The prophet Jeremiah noted that the evil of human sacrifice was one of the reasons the Lord punished the Israelites by sending them into Babylonian captivity. Of course, one might be tempted to believe enlightened modern nations like our own are far above such atrocities, but that assessment would be terribly wrong. In America alone, approximately 60 million children have been offered to the idols of convenience, immorality, the supremacy of self, a person's so-called right to privacy, women's equality, etc. These little babies were ripped and dismembered by the abortionist's knife with only today's scientific expertise distinguishing them from the blades of the Canaanites, the Ammonites, the Moabites, the Aztecs, the Incas, and the Druids of Europe. We enthrall ourselves as having moved forward, when in fact, we have regressed to the very conduct God condemned millennia ago and which also precipitated his judgment. But I suggest there is still one other lesson to be seen in the testing of Abraham's faith. Like Abraham, God desires our unreserved trust when we find ourselves in seemingly impossible situations – confusing situations where everything looks incredibly bleak with no good outcome likely – situations that may require the loss of some prized possession, promise, or possibility. It is in such moments God is closest to us and able to perfectly provide. The text in Genesis indicates Abraham's faith didn't falter even when in preparation to obey God's command his son asked him, "Father, I see the fire and the wood: but where is the lamb for the burnt offering?" Abraham replied, "My son, God will provide." Indeed God did provide by staying Abraham's hand from sacrificing Isaac and producing a ram caught in a thicket by the horns. So the Bible says Abraham named the place where the sacrifice was to occur, Jehovah-Jireh, which means "The Lord will provide." I think it's significant that some of the most common reasons given for a woman to have an abortion – some of the most common talking points in favor of the idolatrous practice of contemporary child-sacrifice – are that the woman can't afford to take care of the child, or she isn't in the position mentally, physically, and emotionally to provide for it. A few years ago, I was talking with a troubled young woman who mentioned some of these factors in weighing whether she would have an abortion. Urging her not to follow through with the procedure, I said, "What God wants from you now is faith. Don't let your trust in him waver. You must know that He is more than able to supply every need for both you and your unborn child. God will never order what he can't pay for." Fortunately, the young woman listened to that counsel and today she and her son are doing quite well. There are numerous alternatives to abortion available and sometimes the ones suggested may not seem to fit. Nevertheless, there is always God who is more than ready to reward those that diligently seek him (Hebrews 11:6). John E. Zoller has beautifully written, "All God's testings have a purpose/Someday you will see the light/All he asks is that you trust Him/Walk by faith and not by sight/Do not fear when doubts beset you/Just remember he is near/He will never, never leave you/He will always, always hear."